This is supposed to be the younger brother of its Senior, the regular George T. Stagg from the Buffalo Trace Antique Collection. 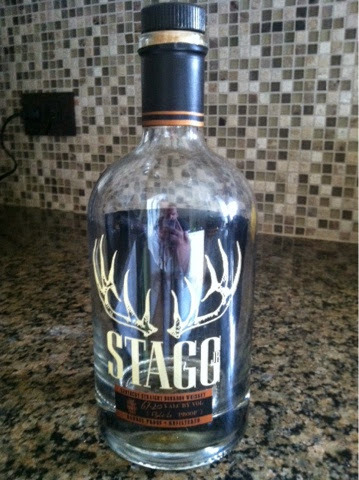 While I have never had the regular Stagg, when I found Jr. on the shelves, I had to try it. Especially with it coming in at a whopping 134.4 proof (which, as I understand it, means this was from the first batch). The first thing I noticed is the dark color. For whatever reason (and it all could very well be in my head), I gravitate towards darker whiskeys, whether it's Scotch, Bourbon or otherwise. So, I was eager to dive into this. But my eagerness hit a wall upon getting a good strong whiff. As would be expected from such a high proof whiskey, I couldn't really get past the smell of the alcohol. My first sip had a lot of burn, which masked much of the flavor of the whiskey. I had only sipped it neat, just to get the taste. I prefer my pours with a single ice cube (some say yay and some say nay to this practice, but it's just that balance that I've found I enjoy). So I plopped on into my healthy-sized glass, let the water tame the burn a bit, and sat down to enjoy. While the burn was still there, as in a drink this strong it's never going to quite go away entirely, the whiskey had otherwise transformed into something incredibly yummy. I'm talking pecan pie with chocolate and vanilla ice cream yummy, or even Snickers with a caramel drizzle yummy. It very much became a dessert with a kick. I completely devoured this bottle. One pour was never enough, and the thought of the next made me salivate. If the flavor profile of George T. Stagg is anything like Stagg, Jr., then I need to start doing the work of tracking down a bottle. I can't wait to try the follow-up batches of this stuff.